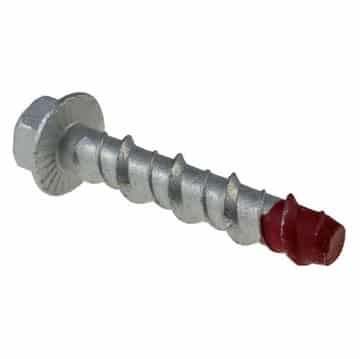 Product description: Screw Bolts are single-unit, screw-type anchors that are used in solid concrete applications. Fixing is achieved by simply screwing the anchor into the pre-drilled hole. As the bolt is screwed in, it creates its own undercut by tapping the concrete hole using specialised thread indentations. In addition, serration on the underside of the flange head gives superior grip to the anchor point. As there is no expansion, only a cutting and locking mechanism. The anchor can be used in close spacing and edge distance applications. No expansion forces, enabling smaller edge distances and anchor spacing.